30% discount on Kindle Covers! Amazon’s touting the special as a way to pick up the perfect gift for Mother’s Day. 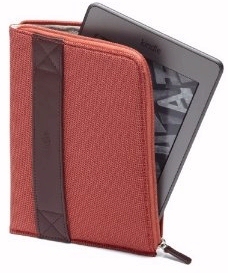 The idea is that after you’ve bought a nice new Kindle, you can also pick up a nice cover to go with it! (Amazon’s promoting the special in a pink band that appears at the top of their pages for the Kindle Fire tablet and the new $79 Kindle.) I’ve created a shorter URL that makes it easier to find the covers — just go to tinyurl.com/KindleCovers4Mom ! Even if you’re just shopping for yourself, it’s a nice way to “window shop”. But here’s why I think this is significant. Last week Amazon was offering discounts on Kindle Fire tablets, and now they’re offering a discount on Kindle Fire covers. There’s been rumors that Amazon’s planning a larger touchscreen tablet computer — sort of a bigger, 2.0 version of their original Kindle Fire tablets. I’m wondering if Amazon’s trying to unload all their tablet-sized covers now, so they can then launch a new line of larger tablets…which, of course, would need larger covers! Whatever Amazon’s doing, it’s your chance to buy a nice cover for your new Kindle, and at a pretty good price. 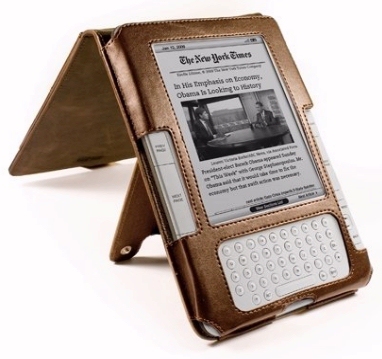 (Amazon’s lighted, leather cover normally sells for $60, for example, but with this discount it’s now available for just $42.) I’m a little disappointed that Amazon’s not offering the same discount for every type of cover, and that you can’t get the discount without also buying a new Kindle. But there’s still a lot to choose from – and I think many new Kindle owners underestimate the benefit of having a nice cover. Just for example, I bought a cover for my Kindle DX, and I love how it brought even more simplicity to the way I read ebooks. It’s made it possible to prop up the Kindle, so I could give my hands a break from holding it while I’m reading! For some reason, that makes it even more relaxing to curl up with a good ebook. But best of all, they’re all available at a 30% discount! 1. Click on either the “Buy a Kindle” or “Buy a Kindle Fire” blue tab below. 2. Check the box next to the Kindle or Kindle Fire device. 3. Check the box next to the cover(s) you want to add to your order. 4. Click the “Add to Cart” button to proceed to checkout. Your 30% discount will be applied at checkout. James Bond Comes to Amazon! Maurice Sendak on Your Kindle?